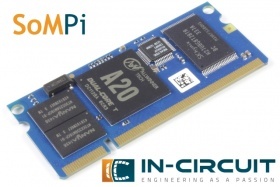 The ICnova A20 SODIMM is a SoC compute module equipped with an Allwinner A20 CPU. It operates with an ARM dual CORTEX-A7 core with 1GHz CPU clock. The table below shows the suitable Application Development Boards (ADB) for the ICnova A20 SODIMM. The board support package contains all sources required to build the linux image for the ICnova A20 SODIMM on the main ADB. On the ICnova A20 SODIMM the bootloader u-boot is preinstalled on the on-board flash. This page was last modified on 7 August 2017, at 17:43. This page has been accessed 28,243 times.